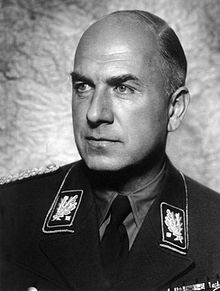 Fritz Todt (4 September 1891 in Pforzheim – 8 February 1942 in Kętrzyn) was a German ingeneur and was responsible for the German roadworks. He was a leader of the SA. In 1940, he became the minister for munitions and armaments. Todt was also a member of the Cabinet Hitler. ↑ Stephenson, Charles (2006). The Channel Islands 1941-45: Hitler's Impregnable Fortress. Osprey Publishing. p. 16. ISBN 9781841769219. This page was last changed on 20 September 2017, at 10:37.